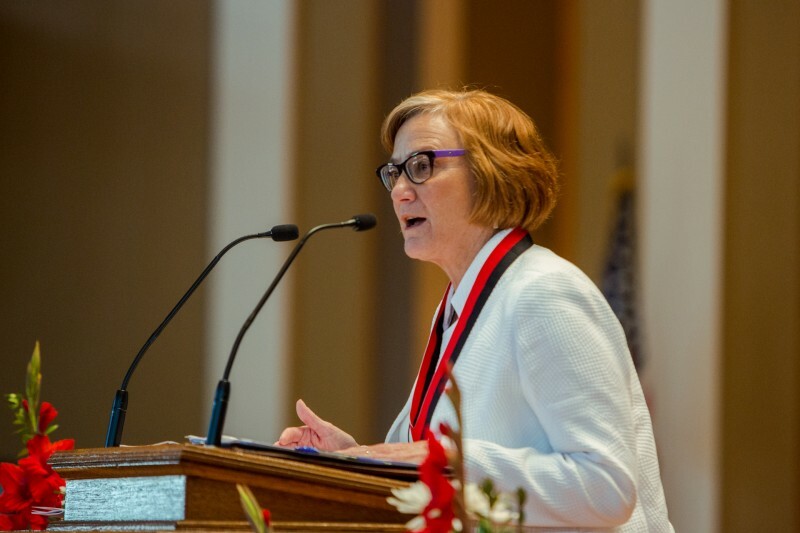 With this presentation of Ohio Wesleyan University’s Distinguished Achievement Citation, the Ohio Wesleyan Alumni Association Board of Directors is honored to recognize Carol Jane Galante for her innovative and effective work in improving urban housing. Carol graduated from Ohio Wesleyan in 1976, after working with two other students to create the Urban Studies interdisciplinary major. During her senior year, she joined Mortar Board and was also a member of Phi Beta Kappa Honorary Fraternity. After Ohio Wesleyan, Carol continued her studies at the University of California, Berkeley, earning a Master of City and Regional Planning degree. Carol has worked in home and community building in both the private and public sectors. As President and CEO of BRIDGE Housing Corporation, the largest nonprofit developer of affordable, mixed-income and mixed-use developments in California, she oversaw the development of more than 10,000 homes in 40 cities. She has continued to have an active volunteer role in many influential housing and urban land use organizations. In 2011, President Obama appointed Carol as Assistant Secretary for Housing/Federal Housing Commissioner at the U.S. Department of Housing and Urban Development. Prior to her confirmation, she served as the Acting Assistant Secretary for Housing/FHA Commissioner, having first joined HUD in May 2009 as the Deputy Assistant Secretary for Multifamily Housing programs. In 2014, she became a professor at the University of California, Berkeley, and Director of the Berkeley Program on Housing and Urban Policy. She was named Builder Magazine’s Top Most Influential Person in Homebuilding in 2006, Multifamily and Developer Magazine’s Executive of the Year in 2008, and Housing Wire Magazine’s Most Influential Woman in Housing of 2012. She also has been inducted into the California Homebuilder Hall of Fame. It is with great appreciation and admiration that we award Carol Galante the Distinguished Achievement Citation for her work on urban development as well as her dedication to helping her community.